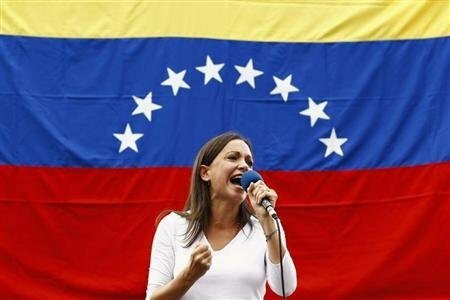 Venezuela has stripped leading opposition congresswoman Maria Corina Machado of her mandate after she spoke before the Organization of American States (OAS) last week. Maria Corina Machado had been invited by Panama to give her account of the recent wave of unrest in Venezuela. But Venezuela’s authorities say Maria Corina Machado “acted as a Panamanian official” by accepting the invitation. The decision means Maria Corina Machado will lose her parliamentary immunity and could be prosecuted for “inciting violence”. More than 30 people have died since mid-February in demonstrations against high inflation, food shortages and violence levels. Venezuela’s National Assembly’s president, Diosdado Cabello, said Maria Corina Machado had contravened the constitution. Diosdado Cabello also said Maria Corina Machado was introduced at the OAS meeting in Washington DC as an “alternate ambassador” to Panama. “Maybe the Panamanian government will now name her permanent ambassador,” he added. Arriving in Peru’s capital, Lima, for a seminar at an institution presided by the 2010 Nobel Prize winning author Mario Vargas Llosa, Maria Corina Machado accused Diosdado Cabello of running a “dictatorship in the National Assembly”. She also said she was prepared to deal with the consequences of her actions. On Saturday, President Nicolas Maduro had already referred to Maria Corina Machado as “former congresswoman”. Maria Corina Machado has been openly demanding the resignation of Nicolas Maduro since the start of the recent protests. Venezuela’s government accuses “right-wing fascists” of inciting the unrest as part of a plot to overthrow the government.